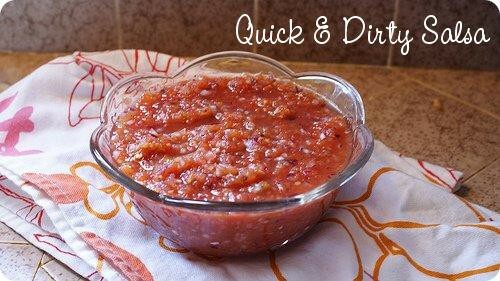 This is a re-post of one of my favorite summer foods – this salsa is not just good with chips, but awesome on wheat thins, tacos, fajitas, just about anything! Put the onion, cilantro, salt, pepper and garlic in a food processor or blender. Pulse til finely chopped. Add tomatoes. Pulse again til desired texture is acheived (we like ours on the not-so-chunky side). Serve with tacos, fresh tortillas & butter, mix into avocados for guacamole, chips, nachos, or my personal favorite, Wheat Thins (I know, but it’s SOO good!). You can use other brands of tomatoes with chiles, but nothing beats ro-tel! *If you have ever been to Chevy’s Restaurant (or Anchos in Riverside CA), and you love their Salsa, try this, and add a drop of mesquite liquid smoke – it will be a dead ringer! I am adding this post to Mouthwatering Mondays over at A Southern Fairytale (hi Rach!) – check it out, there are TONS of great recipes posted there! !